This home is actually on the island of CLEARWATER BEACH and ON THE WATER with a large private dock. CLEARWATER BEACH has been named as one of the top 25 beaches in the WORLD and the #1 BEACH IN THE U.S. MANY TIMES. Come enjoy the island life with our fabulous beaches and gorgeous warm Gulf of Mexico waters. Don't be fooled by the ads which are in 'nearby' communities or 'near' the water. This 1940's Clearwater Beach home has all the modern updates. Charming wood floors throughout with fireplace. Three bedroom, two bath, split plan. Large rooms. Lovely furnishings complete with 2 king-size beds, 1 queen bed, and two single beds. Ethan Allen dresser and 'sleigh bed' in master bedroom. Fabulous views of Clearwater Bay. Fully-equipped open kitchen. New stainless Samsung fridge with freezer and ice-maker on the bottom. Maytag dishwasher. Cooktop/oven. Disposal. Full size washer and dryer in laundry room. Linens, dishes, cookware, and many amenities are provided. Formal dining room. Florida room/porch. Two-car garage with genie. Fenced yard on the water. Owner has been a Realtor in Clearwater for many years. I would be happy to get any information on the area for you. Super fishing from deepwater dock. Bring your boat - Boat lift for a 10,000 lb boat. Great entertainment watching the dolphins and boats. 5 minute walk to world-famous sugar white sands of Clearwater Beach, many fine restaurants, tourist attractions, etc. 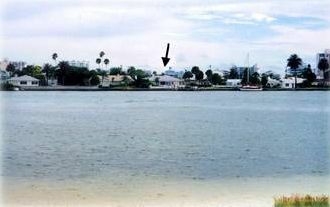 You can see the Clearwater Marine Science Center and Aquarium from our dock. This is where our local movie star, WINTER the DOLPHIN from Dolphin Tale lives. Lots of activity if you want it or just a quiet beach house if you prefer. Million dollar views in a multi million dollar neighborhood! Listed rates may vary depending upon which week, our bookings, and calendar events. . Five day rental minimum. Hi! I'm Mary Rogero and I have been a Realtor in Clearwater, Fl. for 30+ years. I love Clearwater, and I truly enjoy being able to share it with people from all over the world through this vacation rental. There are so many wonderful people who have stayed in this beach house with their families. They all have many special stories as to why they came to Clearwater, and why they wanted a private residence rather than a hotel. It is also great that they can bring their 4 legged family members too. With a 3 bedroom home, families can have a tremendous vacation together and be able to cook at home if they want. They can bring their boat and keep it right on the boat lift at the dock, or tie it up at the dock. With so much space in the home, everyone has plenty of their own 'space'. The dock is fun during the day, and beautiful for watching the sunsets and the evening lights upon the water. I want everyone who stays at the beach house to have an incredible experience and to truly enjoy their Florida vacation. I purchased this home in 2002 because as a Realtor here in Clearwater for 30 years, I knew it had an ideal location even beyond being on Clearwater Beach. It is an easy walk to Pier 60 and to the World Class sugar white sand beach. The private dock is so relaxing and private. The home itself is spacious and well designed with the master bedroom being separate from the other two. The rooms are all large, and there is a 2 car garage. Even though the home has easy access to shops and restaurants, it is still in a quiet residential neighborhood. This is a private home with its own dock. You are not sharing a dock with hundreds of other people as in a condo. Pull into your garage with your remote control - no elevators, lobbies, etc. All one level on the water - no one living above, below or right next door. On the open Bay with a private dock. two blocks from the Gulf of Mexico. On the open Bay with private dock. two blocks from main beach. on the open Bay with private dock. On the open Bay with private dock. The Gulf is two blocks away. This home is on the open bay with a large dock just around the corner from the main Gulffront beach and Pier 60.
table for four in the Florida Room looking out over the open water in addition to the formal dining room. LOVELY SPACIOUS HOME. FABULOUS LOCATION. Such a great experience renting this three bedroom home. It is on the incredible open waterfront with a super dock for fishing. We could walk everywhere and the neighborhood is safe and lush. The home is spotless and had more than everything we needed. The owner couldn't have been any nicer and was very accommodating to us. Best family spring break vacation EVER! Our family of 5 plus our dog thoroughly enjoyed this beach house over spring break. It's the perfect location-- walking distance to the beach. My husband loved fishing off the dock in the back yard at all hours of the day and night. Our dog loved to run free in the fenced yard. This house has everything you could want for a vacation house. It was very clean and comfortable and we're looking forward to coming back soon! Also, the owner Mary is so sweet and helpful--great experience! was remembering how nice last winter was in large part due to renting this house for February. Really felt like home, and the owner was very accommodating. Get up in the morning and drink coffee overlooking the water, watch the boats come in at night. Had the kids come for a few days. Loved it, and sorry I did not put my comments here sooner. Thanks for the nice review! These reviews really help others to decide on their vacation home. I loved having this incredible couple stay at the beach house for a month with their adorable golden retriever. Doug and Pam, I hope that you return. Come back, sit on the dock of the bay and watch the ships go by! We've had incredible weather this month. 85 degrees on Christmas! Perfect vacation in perfect house! Very simple yet delivered best of all - fishing, beach, dining! We got this house to get all the beast what Clearwater beach has to offer - white sand beach, fishing, dining. Very private street, quite and very close to everything. Mary, owner of the house, was very nice and prompt with any questions and easy to work with. We had great time and enjoyed this wonderful house with water view. My husband was fishing all the time - from back yard or just walking to boats at the marina and go deep sea fishing. We would recommend this house to all. I am so happy that you enjoyed your vacation and that your husband had a very happy birthday with catching lots of fish! Also glad that you enjoyed all the wonderful restaurants within walking distance along with our fabulous Clearwater Beach. Come back soon...I really enjoyed meeting you! Great Location! Great view of the Bay! This is a perfect get away home, short 5 minute walk to beach with a dock on the bay, great view of the bay from the porch. We enjoyed watching tour boats going out and coming in. We also enjoyed walking to the pier in the evenings to watch the sunset. The home is clean and well-maintained the street is quiet. Mary is wonderful to work with and prompt in her responses. We would definitely recommend this house. ABSOLUTELY THE BEST PLACE IN CLEARWATER TO STAY!!!!!!!!!!!!!!!!!! My family and I stayed a week in July 2014 and we loved it. The place is very well kept and is in walking distance of everything. 3 min walk to beach and own personal dock to fish off of and fenced in back yard. Furnished house and all, only thing you need is to set back and relax and buy your own groceries that is it. I would defiantly rent this house again and again. The owner is fantastic very well informed of everything and the pictures of the place are exactly as it is. Any family with kids or adults it is a PERFECT place to stay!!! We enjoyed it and my 5 year old grandson was in heaven, will vacation there again!!!!! !